Train how you fight and experiment with the various weapons and vehicles that Battlefield V has to offer. Editorial Note: The Battlefield V Practice Range has since been updated as part of Chapter 2: Lightning Strikes. Please read about the latest changes in our article. The practice range is the place to learn and sharpen the basic and advanced skills of Battlefield™ V. Get a feel of how each base weapon handles, and how a few of the vehicles drive and fly. Practice the way you want at any time, without the urgency of a multiplayer match. The Practice Range has modes for players to hone their individual skills or simply experiment with innovative tactics, all while playing around in the Battlefield sandbox. The soldier you'll play is on the Practice Range is a unique soldier with no class restrictions on weapons allowing the most flexible way to quickly try different load outs. Let’s break down the three modes with more detail. Practice the fundamentals of marksmanship with this wave-based mode. The goal here is to take out as many pop-up targets as you can. There are three type of waves to choose from, with each starting with four introductory, waves that are not timed. However, after wave four, put your game face on because a ticket counter will appear that bleeds tickets over time. Hitting a target rewards five points for headshots and one point for body shots. The mode ends once all tickets deplete. A round should last about 5 to 10 minutes. Rapid fire wave – Practice taking out many targets as fast as possible. Long range wave – Allows the player to practice proficiency with scopes. Hunt wave – Bored of standing? Find and chase targets in this wave. Available weapons include the StG 44, FG-42, Lee Enfield No.4, and STEN. High scores are locally saved. Pull a lever and the speedy Kubelwagen will spawn, fresh from the shop and ready for you to drive. Enter the vehicle and cruise to the starting area. Targets will appear for you to drive over and a countdown will begin. Rounds last about five minutes or so, and your score, based on how many targets are met with your bumper, will be saved locally. Keep both hands on the wheel here because there is no shooting. Tactical squad play can be difficult to practice in the chaos of a multiplayer match. Enter the Open Range version of the Practice Range. 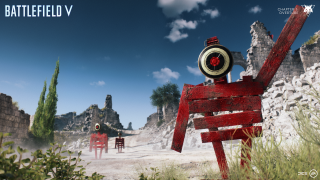 You'll spawn on a modified version of the Hamada map with markers pointing to areas where you can try different shooting exercises, shooting practice, or jump into airplanes and vehicles. Tired of walking? Search the area and you'll find a way to quickly move around to the different sections the Open Range has to offer. Flying – Pilot a Spitfire or Stuka and get a better feel for the skies. You can destroy stationary ground or air targets, switch planes at any time, and quickly respawn if kissing the ground. Driving – Hop into the seat of the Churchill Tank, Flakpanzer IV, or Kubelwagen transport vehicle for some loops on the desert track. Players will get ground targets to practice their shooting and aiming skills, or air targets if the players chooses to spawn in an AA Tank. Like planes, you can switch vehicles at any time and respawn if you drive off a cliff. Shooting lanes – Practice your shot accuracy on 25-, 50-, and 100-meter targets down range. This is a great place to test the bullet spray and recoil patterns of all the unspecialized launch weapons. Angling – We know that each input set-up is particular to the player, so this exercise is designed for tuning aim sensitivity settings to get that flickshot down pat. Here, targets will appear at different locations on a wall. Once hit, they’ll disappear and reappear in a new location. The player can set the difficulty to easy, medium, or hard, which impacts how quickly targets appear and disappear. Players also get a streak counter that expires as soon as a player leaves the designated area. Turning – When that enemy hit indicator appears behind you on the battlefield, you’ll want to be able to return fire ASAP. This exercise surrounds the player with targets that change location once they’re hit. Adjust the difficulty from easy, medium, or hard to change the regularity of targets. Players also get a streak counter that expires as soon as a player leaves the area. Weapon racks are placed throughout the open range for players to equip base launch weapons and scopes. Interacting with the rack brings up a weapon selection screen from which the player can pick from a wide selection of primary weapons from across all four classes.